Leadership Forum organized a seminar on financial securities. This was not just for the finance majors but for any students interested in the growing world of investment. 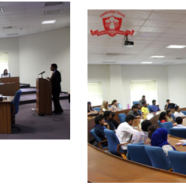 The seminar was conducted by the Director of Abbasi Securities, Mr Ali Abbasi. He was invited to talk about the importance of financial securities and Stock Exchange of Pakistan. He also shared a lot of insight on the importance of investment in today’s world. He related a lot of first hand experiences to try and make the content understandable by the laymen listening to it. This interesting session was concluded by an interactive Q/A session.